It is in this light that the rhetoric of Edwards can be mediated. In speaking of his preaching one could say without appeal to cliché, “He preached his heart out,” because the content of his preaching was heartfelt. “For out of the abundance of the heart the mouth speaks.” His religion was a potent combination of high theology and the experiential faith that places men under the Lordship of Christ- and it was this religion of which he spoke and wrote. Some have argued that Edward’s preaching style was unremarkable. His sermons were written in a small and nearly illegible script which required him to often lift his manuscript close to his eyes. However, there are numerous reasons to reject the above as normative. First, Edward’s had sat under the tutelage of his grandfather, Solomon Stoddard. Stoddard was an excellent preacher in his own right, and “had spoken forcefully in print against ‘reading’ preachers.” Second, Edwards view preaching as proclamation, and thus he observed the necessity of the human instrument in the delivery of the message. Third, Edwards did not always preach from a written manuscript, especially in his later years. The rhetoric of Edwards was forceful and not flamboyant. It was articulate and not hyperbolic. It was a kind of speech which drove men to repentant faith- his preaching was apostolic. Edwards viewed God as the all sufficient communicator, and as such he employed the imagery and analogies present in the Word of God. Therefore, it is little wonder that the brilliance of his verbal mastery is found in his reliance upon that which is theopneustos. Lawson, Jonathan Edwards: Prince of the Puritans. English Standard Version, Philippians 1:21. For further argumentation regarding whether Edward’s preaching was merely a wrote exercise or the proclamation his theology demanded see Murray, 188-191. Edwards, Jonathan, and John Edwin Smith. The Works of Jonathan Edwards. Vol. 2. New Haven, Conn.: Yale UP, 2009. Print. English Standard Version, Ed. Lane T. Dennis. Wheaton: Crossway, 2001. Print. Elwell, Walter A. Evangelical Dictionary of Theology. 2nd ed. Grand Rapids, Mich.: Baker Academic ;, 2001. Print. Lawson, Stephen. "Jonathan Edwards: Prince of the Puritans." One Passion. Web. 10 Nov. 2014. 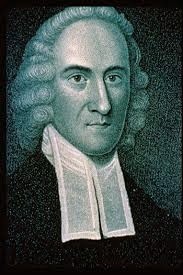 <http://www.onepassionministries.org/the-life-and-legacy-of-jonathan-edwards>. Murray, Iain Hamish. Jonathan Edwards: A New Biography. Edinburgh: Banner of Truth Trust, 1987. Print.